On February 3, 2015, Dr. Karen G. Schollmeyer and Allen Denoyer (Archaeology Southwest) will discuss what animal bones and stone tools can tell us about hunting, butchering, and eating in the distant past. The program is free, but participants are encouraged to order their own refreshments. Although kids may attend with adult supervision, Archaeology Cafés are best for adults and young adults. If accommodation is needed due to disability, please contact Kate Gann by email or phone, 520-882-6946 x 16. 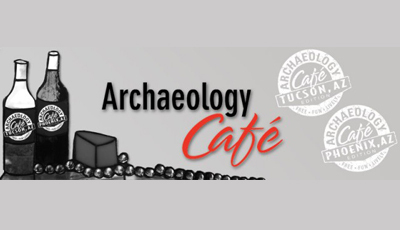 The 2014–2015 season of Archaeology Café is made possible, in part, by Arizona Humanities.